Liverpool, a city that has upheld its solid place in the history of rock and roll, has once again produced some new music worth our attention. 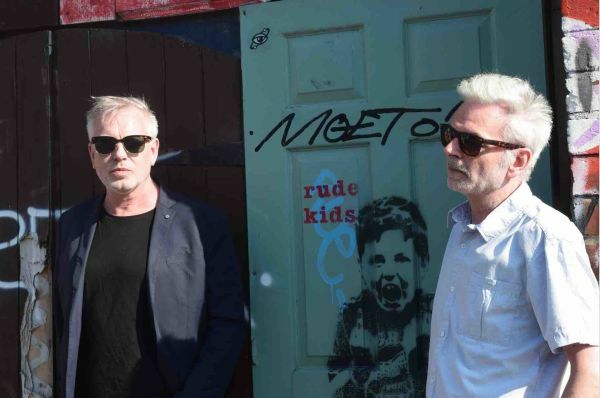 Recently formed from the ashes of 1980s post-punk group The Room, former bandmates Paul Cavanagh and Dave Jackson recently put their two heads together to create dozens of new songs over the course of a year, the musical output which we are now seeing in their new project The Room in the Wood. In support of their new The Mars EP, which released digitally in November and finally just released on limited-edition CD via A Turntable Friend Records, the band present their new video for “Time Machine”. Loaded with sweet melancholy, the stylings and delivery have a distinctive retro feel. “Time Machine’ is another vaguely sci-fi rumination, wistfully reflecting on the passage of time filtered through the vision of HG Wells. We thought that ‘Mars’ and ‘Time Machine’ gave the EP a science fiction edge and Mark Jordan’s video reflects that,” says Paul Cavanaugh. The accompanying video for ‘Time Machine’ was shot, edited, and ‘artified’ in Liverpool and vicinity by Marco Cesare, who made videos for luminaries such as Shack, Holly Johnson, and the Blow Monkeys. This new EP comes hot on the trail of ‘Mars (Won’t Save Us)’, the EP’s lead track and a riff-based psych-rocker that focused on the foolishness of Elon Musk’s ideas about colonizing the Red Planet. We are reminded that, “Mars won’t save us. Mars has no air.” It is accompanied by a psychedelic video composition by ex-Send No Flowers and Moongoose collaborator Mark Jordan. Featuring contributions by drummer Colin George Lamont (Mark Lanegan, Dave Gahan), this EP was recorded by Steve Powell (Michael Head & the Red Elastic Band) at his Liverpool-based Ark Studio and mastered by Pete Maher (Barry Adamson, The Alarm). This new Mars EP follows their 2018 debut album The Room in the Wood and the Magical Thinking EP prior to that. “The song ‘Every Lie’ is a bluesy, countrified stomper bemoaning the rise of the populist right, and inspired by the late great Johnny Cash – this is a response to Trump and Brexit. ‘Get Clear’ a Spanish guitar-tinged ballad extolling the virtues of escaping cult thinking. It follow ups our song ‘Magical Thinking’, but is sung to a friend escaping some dogmatic cult,” says Dave Jackson. Dave Jackson has been writing and performing since his teens with The Room, 051, Benny Profane, Dust, Dead Cowboys, and as Dave Jackson & The Cathedral Mountaineers with former Shack guitarist John Head. He’s released 10 albums with these various incarnations and had 7 John Peel sessions with The Room and Benny Profane. He’s also appeared on the Whistle Test, Janice Long, and Saturday Live. Jackson has also toured the UK, Europe and the USA extensively with The Fall, The Violent Femmes, Aztec Camera, The Lemonheads, and The Wedding Present. He currently teaches creative writing at Liverpool John Moores University and has developed his novel Violet City as a low-budget fantasy feature film. Paul Cavanagh has performed as Cabin in the Woods and as part of Mike Badge*r’s *Shady Trio. He worked with The Room drummer Alan Wills at Deltasonic Records with The Coral and The Zutons. Paul has also recorded 4 John Peel sessions and released albums with Top, It’s Immaterial, and Moongoose, and critically acclaimed singles with Gloss. Why not stream their whole ‘Mars’ EP via Bandcamp?